Ugly Fruit Trivia: The Results!!! Thank you everyone for supporting @theuglyapplecampaign for the past few weeks! We also had a great response to our trivia, keep reading to find out how you went compared to others! Thanks for participating and be sure to share with your friends to see if their fruit knowledge trumps yours! ON AVERAGE, YOU CORRECTLY IDENTIFIED 32% RIPE FROM WRONG! You Can Test The Ripeness Of Which Fruit With A Black Light? 2. Which fruit no longer ripen once picked? 3. Which fruit ripens 6-10 times faster at room temperature than in the fridge? 5. You can test the ripeness of which fruit if it bounces? 6. Name the only vegetable or fruit that is never sold frozen, canned, processed, cooked, or in any other form except fresh. 7. Which fruit ONLY ripens once picked? Tonight we bring to you another collaborative post with Stay Hydrated! Avoid the sugary beverages by making your own fruit infused water! 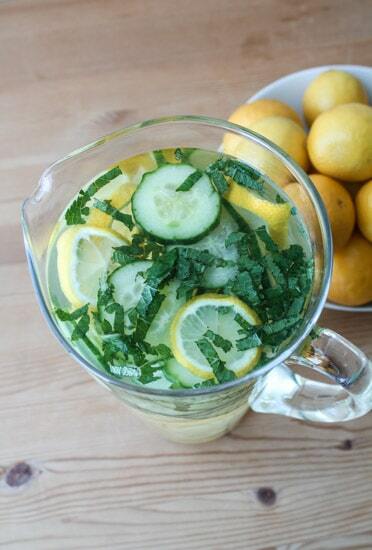 It’s a nice fresh kick on a hot summer’s day, perfect to keep you hydrated and healthy! You can spice it up with any ugly (overripe) fruit you have lying around; discover a killer fruit combo? Let us know in the comments! Today we are doing a different take on our recipes, inspired by the talented Tasty Beauty, we have created 3 different types of natural, anti-oxidant rich face masks your skin will love you for. What a great way to recycle or use up your overripe, misshapen or blemished fruits and turn them into something that can make you feel AND look good! Unfortunately many mass produced beauty products contact skin irritants such as perfume, alcohol, paragons and preservatives. These home-made face masks are the perfect alternatives and only contain all the good things such as vitamins, minerals and protein. For all our masks, let it sit on your face for about 10-15 minutes, follow up with a cool clean water rinse and gently pat dry the face. This is a great mask that will keep your skin moisturised and fresh! Berries also contain many vitamins and nutrients, helping fight free radicals to keep your face glowing! From spotty brown to spot free skin! 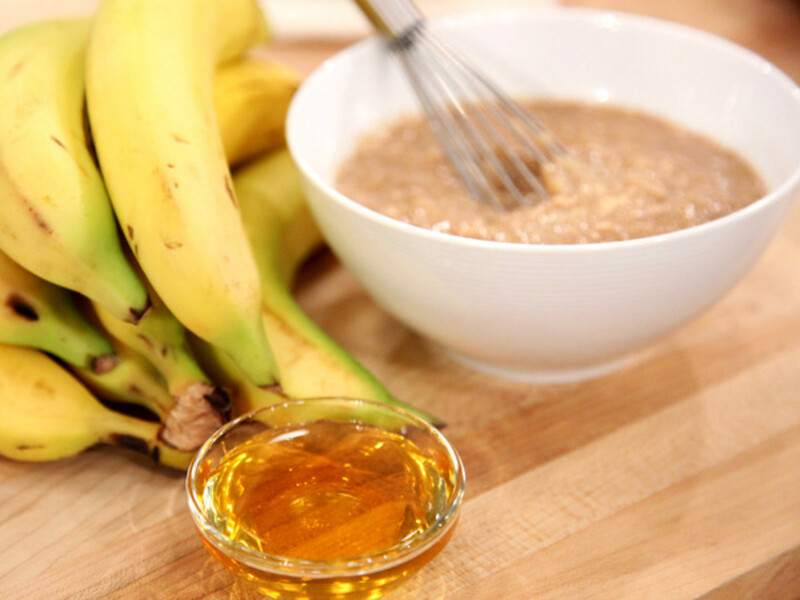 The benefits of this mask is abundant -From the numerous Vitamin B, E, A and C as well as minerals found in bananas to help improve complexion and get that radiant skin, the honey helping to absorb and retain moisture, to the oats that acts as an exfoliator for dead skin cells! 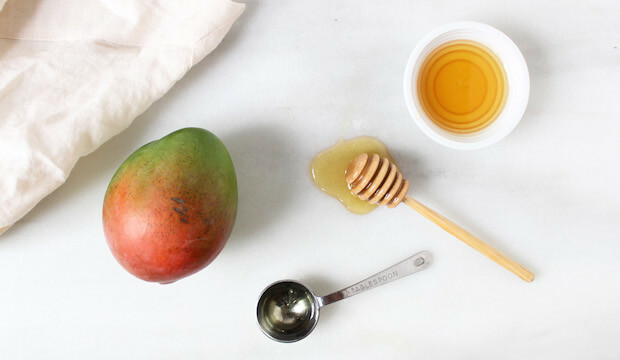 Mangoes are a great source of vitamin C, it is extremely hydrating and rich for your skin. The addition of almond oil has great anti-aging properties and is a great anti-inflammatory. Not to mention your skin is going to smell delicious after this! Here’s a guide to help you optimally store your food and plan your meals according to the shelf life of food to prevent unnecessary wastage. So if you bought a box fruit you know you’re just not going to finish anytime soon, make sure you freeze them or find alternative ways to preserve them for later use. Don’t know whether your broccoli or beans are going to go off sooner and which to eat first? Now you can easily refer to this guide and store the uneaten alternative properly! Print this guide and stick on the fridge, and better yet share it with your friends and family. Take good care of your food and you’ll feel better about not tossing out otherwise delicious food (You’ll also be surprised at how money you could save!). Carefully spoon into very clean jars and let cool. If you haven’t eaten it all already, it will last in the fridge of at least a couple of weeks. And like with most fruits, one of the easiest ways to preserve overripe strawberries is to freeze them if you’re not quite ready to cook them into dessert. Frozen berries last for ages and mix well in a smoothie, ice-cream, and jams. Better yet throw them into any baked goods to add a bit of summer flavour! Alternatively, use your overripe strawberries in a DIY mouth-watering lip stain! W’e’ve collboarated with Tasty Beauty to bring you this recipe! Instead of throwing out your ugly strawberries, now you can turn them into something that will make you feel good AND look good! What are your favourite ways to use strawberries? Let us know in the comments! Today we are going to talk about something a little different- composting! For those who don’t know, composting is nature’s process of recycling decomposed organic materials into a rich soil known as compost. Just to name a few benefits, composting adds nutrients to plants and add nutrients to the soils by recycling waste, and helps to reduce landfill waste. Talk about a triple whammy! While we try to encourage consumption of all of our fruits and vegetables as much as we can without throwing any way, some of them inevitably ends up in the bin such as apple cores, vegetable peels and fruit rinds. Not all food scraps can be composted, but it is safe to say all vegetable/fruit wastes including moody and ugly parts are compostable. Simply find a bin that make it your compost bin and leave it under the kitchen sink for easy composting. Or if that’s not a viable option, here’s a little tip I want to share from Lifehacker. 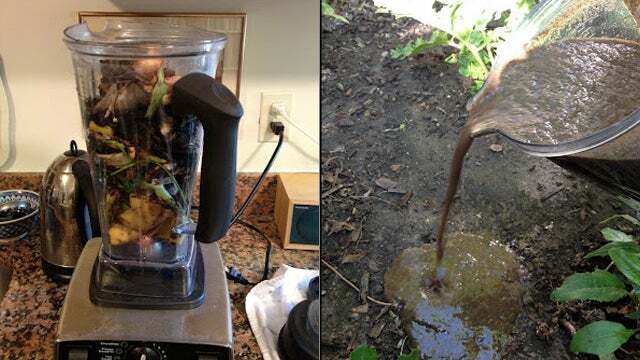 Throw your food scraps in the blender for some instant compost! You can fill up the mixture with other plant scraps, newspapers, coffee grounds, old bread or anything made from flour, any grains (the list goes on! check out the nice little infographic below), add some water to just above the scraps and blend until smooth. Now that it’s like a puree consistency, spread it out in your garden, even mix it into the soil or mix in new soil if you’ve got some. While this mixture isn’t technically compost yet, by breaking down the raw materials in a blender will help organic matter decompose faster. A great way to get rid of the fruit flies is to freeze your scraps until they need to be blended! Trust me, your garden will be reaping the rewards later! This is a great way to recycle waste such as your rotten fruits and vegetables! The weather is getting warmer and summer is just a shy month or so away, you know what that means… strawberry season is upon us! Those luscious and bright red berries are so sweet, and it’s got just the right hint of tang. Add that healthy dose of anti-oxidents, who could resist! They literally come in all shapes and sizes, and I have often found the stranger they look the sweeter they become. Unfortunately, misshapen strawberries are a fact of life but luckily, they taste no less sweeter than the perfectly symmetrical ones. Nubbins and button strawberries are caused by external, usually damaging agents. Feeding by plant bugs, cold injury to nutrients deficiencies can cause deformed strawberries to form. Additionally, inadequate pollination and high temperatures can result in poorly formed strawberries. The other type of deformed strawberries have a cockscomb or fasciated appearance, hence their name. 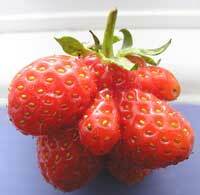 They generally look like several strawberries have fused and grown together as a single fruit. This deformity is usually caused by either short daylight intervals or cold, dry weather. 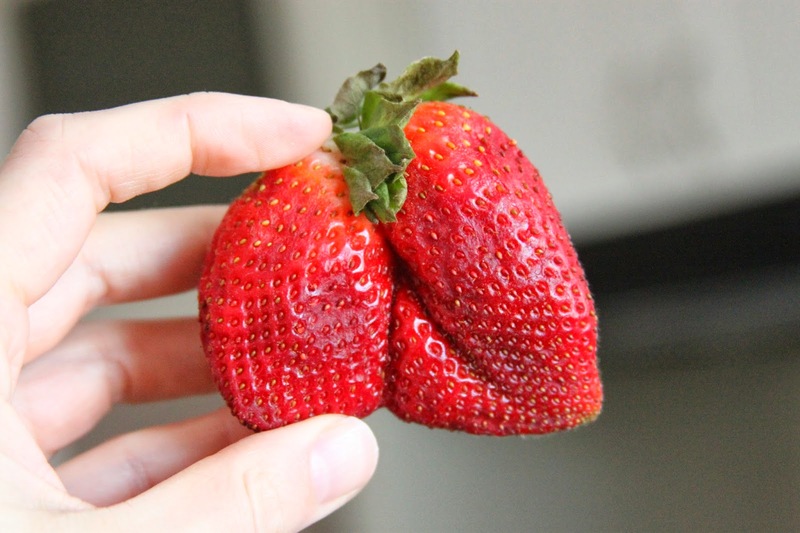 Misshapen strawberries are safe to eat. To spot truly spoiled strawberries, look for splotches on the exterior. You can also press a few of the strawberries with your index finger; the texture should be firm but give slightly to the pressure. Overripe strawberries are mushy, they are still fine to eat within a day and are best to use them in recipes. If the berry has gone bad it will often have a rotten odor and you should discard them right away. Strawberry mold often start out looking white, then progresses to a light greenish grey colour. Strawberries are so versatile in the kitchen and knowing how to store them can dramatically reduce unnecessary wastage. They are also very delicate fruits, they are similar to a sponge in the sense that they will absorb absolutely everything! Some of the main causes of spoilage is if they come into contact with dirty water or equipment during harvesting; unhygienic handling of strawberries can also easily spread disease within the fruit. Keep your strawberries dry and only wash before eating them. Strawberries soak up every bit of moisture which makes them more likely to get mushy, spoil faster, and get moldy quicker. If you don’t plan on eating your strawberries the day you bring them home, then refrigerate them. It is highly recommended you remove them from the original container, and store them whole and unwashed in a partially-closed container lined with paper towels to absorb any excess moisture, preferably in a single layer so they don’t get crushed. They should stay fresh for up to 7 days. To keep strawberries for a longer period, you can freeze them. Remove the stems, then freeze in a single layer on a baking sheet until solid. You can store them in an airtight container or tiptop freezer bag. Frozen strawberries are great as you can throw them into any smoothie, oats or any baking recipes like muffins or cupcakes. We might just share some of our favourite recipes in the coming week! Even completely brown bananas are fine to use to make banana bread; this can take 2-4 weeks of ripening. When you eventually cut it open the flesh should be quite gooey and syrupy, which is perfect for your banana bread. If the flesh is more dark and mealy, they are still safe to eat. If you suspect your bananas are rotten or smells “bad” then discard them right away. For once, forgetfulness can be rewarded. A bunch of forgotten, overripe bananas on the counter is the perfect excuse to make a loaf of banana bread. In fact, experienced bakers will tell you that the more brown and mushy your bananas are the better the better and more flavorsome they are for your baked banana treats. In fact, black bananas (such as pictured above) are PERFECT to use in baking recipes as long as the fruit is not mouldy. So next time you’ve got some sad, brown and spotty bananas lying on your kitchen counter, don’t throw them out but rather, make some delicious “ugly banana” bread that your neighbours will be knocking on your door for! Preheat oven to 185 degrees. Lightly grease a standard loaf pan with butter. In another bowl, mash up bananas and milk. Once well mixed, add in honey, butter, and egg. Mix well. Stir in dry mixture until well blended. Fold in the choc bits. Pour batter into prepared pan and bake for 45 minutes or until a toothpick inserted into the centre comes out clean. Cool in pan for at least 10 minutes then turn onto a wire rack to cool. To freeze, wrap loaf tightly wrapped in foil and it can last in the freezer up to 3 months. IS EGGPLANT A FRUIT OR VEGETABLE? The Eggplant aka Aubergine is actually a fruit, a berry to be exact. Besides having a botanical identity crisis, they are also one of the fussiest produce in terms of harvest, handling and storage. Eggplants are quite low in calories but high in fibre which is great to fill you up with the many versatile ways to cook them! Keep reading to find out how to select the freshest eggplants, how to tell cosmetic bruising from spoilage and how to cook imperfect eggplants. Eggplants are usually harvested as soon as they are ripe otherwise they may get bitter or mooshy on the inside. In order to choose the freshest eggplant, choose as you would many other fruits by picking ones that are firm and plump. One way to test whether an eggplant is ripe is to press in with your finger and the flesh should bounce back a little. You should choose eggplants that feel heavy, as hollow ones tend to indicate brushing or spotting of the fruit. Smaller, asian eggplant varieties tend to bruise less than the large ones. The freshest eggplants should have a smooth and glossy exterior with no wrinkling. Skin wrinkles, just like us, are signs of aging; and like us, aged eggplants are more bitter to the taste. Eggplants are very delicate fruits, which means rough handling of them cause them to bruise quite easily. Once an eggplant is bruised, the oxygen penetrates its juices and causes damaged areas to go brown. However, most of the eggplant remains usable. if it is too bitter, just cut out the bruised/browed flesh. Once cut, the eggplant will also continue to brown like an apple so make sure you don’t leave it too long before you use them or give them a lemon juice treatment to keep them from going brown. Bruising is basically physical damage to the skin, allowing air, yeasts, mold and bacteria to enter. The best way to evaluate the health of your eggplant is to cut it open. Discard your eggplant if there is any visible mold inside the flesh. If the rotted area is only small and distinct, you can cut it away and cook the rest of flesh if they are still firm and pale. We don’t recommend keeping your eggplants for too long as chilling them can cause the flesh to darken and deteriorate. Choose only unblemished eggplants when you’re cooking dishes requiring cooking them whole and unpeeled, or in perfect round slices. Select soft-spotted eggplant for dishes that demand more careful processing. Finally, throw away eggplants that seem to have mold on the skin or flesh, emit a foul smell and are heavily spotted and tough on the inside. What is the order in which you should cook your eggplants to maximise their kitchen shelf life? For dishes that require eggplants to be cooked whole and unpeeled, or in perfect round slices use unblemished eggplants. For dishes that demand more careful processing, use soft-spotted eggplants. Salvage your spotties! There are many ways to cook partial eggplants that have been cut away from bruised/rotted areas. Remember to brush them with lemon juice to prevent further browning. Another tip is to scoop out the browned seedy bits and sprinkle with salt or soak in salted water- this will extract the bitter taste from browned areas. Some of our favourite recipes for partial eggplant pieces are grilled eggplant slices, breaded for eggplant parmigiana, used in mixed dishes and dips.